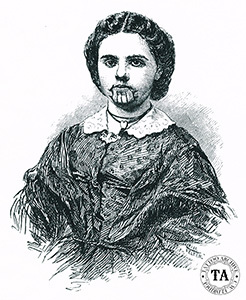 Olive Oatman was part of the nine member Royce Oatman family who left the relative safety of a westbound wagon train in 1851 and headed out alone on the Gila Trail. 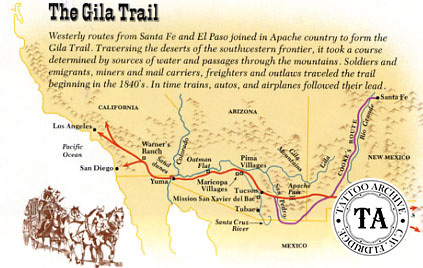 The Gila Trail was one of the many routes used by settlers and gold-hungry miners to get to the west. Westerly routes from Santa Fe and El Paso joined in Apache country to form the Gila Trail. Crossing the desert to the southwestern frontier, it took a course that was determined by sources of water and passages through the mountains. Beginning in the 1840s soldiers, immigrants, miners, mail carriers, freighters and outlaws all traveled this trail. In time, trains, automobiles and airplanes followed their lead. West of Gila Bend, Arizona their wagon was attacked by Yavapai Indians. All were killed except for one son who escaped and two sisters who were captured. After a year the girls were traded to the Mohave Indian tribe. The Mohave's of the lower Colorado River were unique in many ways. They were one of the few tribes of this area who relied on farming and were very warlike. As with most North American Indians, they were fond of personal adornment. Two of their favorites were tattooing and body painting. Men and women would tattoo their chins and sometimes their foreheads. Both sexes would also paint striking designs on their faces, hair and body. There was no special guild of tattooists and most tattooing was done on people between the ages of 20 and 30. Part of the Mohave belief is that any man or woman without a tattoo on the face would be refused entrance to Sil'aid, the land of the dead. Their belief was so strong that black paint would be rubbed on the tattoo marks of the dead so they were more visible on judgment day. Because of this belief, many old folks who had not been tattooed in their youth were tattooed on their deathbeds. The younger of the sisters died, but Olive survived until she was ransomed in 1856 by the United States Government at Ft. Yuma. The Oatman massacre and the telling of the story thereafter, did little to stem the tide of westbound immigrants, and to this day, the place whethe Oatman's wagon was attacked is known as Oatman Flats. Photos shortly after her ransom showed her in a cabinet style photo wearing a black dress with her hair pulled back and Mohave style tattooing on her chin; five vertical lines, with two triangles set at right angles to the two outer lines. Published accounts of Olive's capture and torture were quickly publicized, and for a while, she displayed her tattooing on a cross country lecture tour. Throughout tattoo history attractions have used fanciful tales to make their shows more interesting. Dreaming up stories about being captured by "Red Indians" and forcibly tattooed was very common. Although she objected, even the famous Betty Broadbent worked in Australia behind a painted banner which showed her being tattooed against her will. Years after she retired, Betty would become upset when talking about it. Her case was probably the exception to the rule, because it seems that many attractions used these tales to add to their box office. 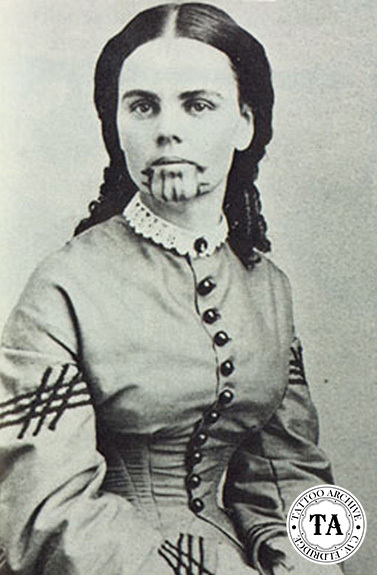 The Olive Oatman story is one of the few along these lines that can be substantiated by hard fact. Chin designs with the Mohaves were chosen by the tattooists and were based on the shape of the face. Narrow faced people usually wore designs of narrow lines or dots to accentuate the length of the face. Patterns for broad faces tended to have wider lines and cover more of the chin, making the face look even broader. The upper lip was not tattooed. Forehead designs were chosen by the wearer and there were different patterns for men and women. They would be placed in the middle of the forehead just above the eyebrows and generally consisted of simple lines, dots and circles. There were a few variations for the tattoo locations. Warriors may have had circles tattooed on their chests, with line radiating tower the shoulder, and important men sometimes would have "T" shaped designs tattooed on both sides of the face just below the cheekbone.